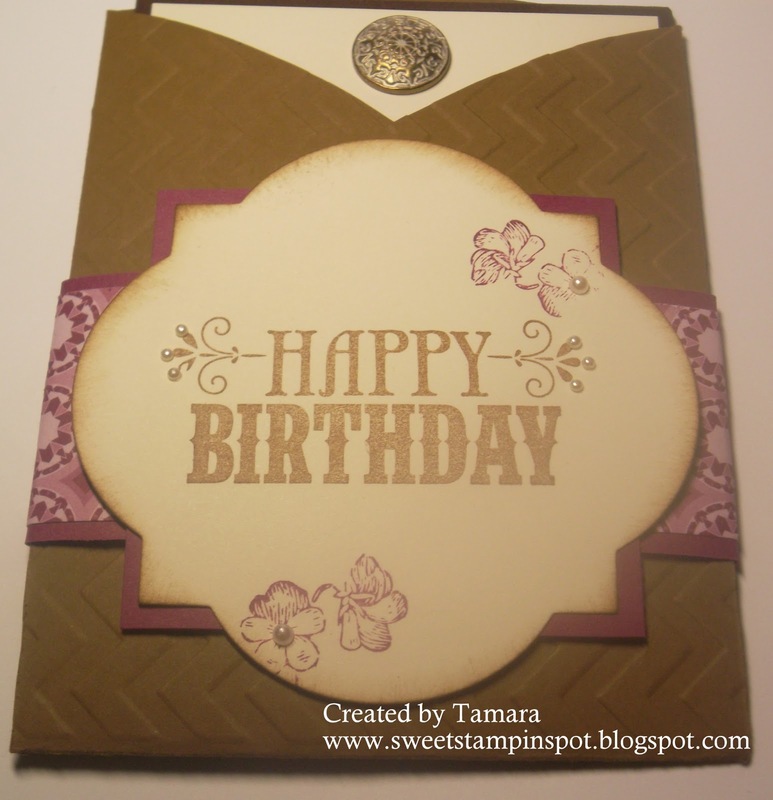 Sweet Stampin' Spot: Happy Birthday! 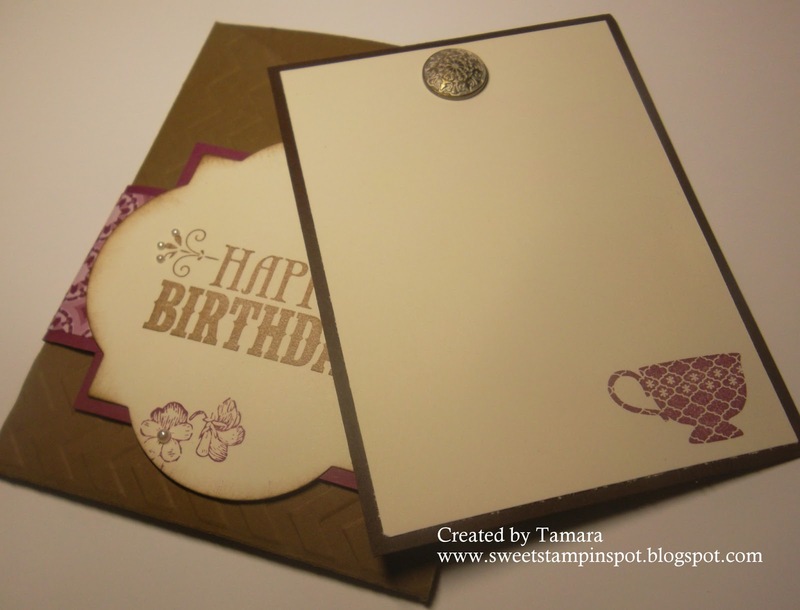 Happy Birthday, Sweet Stampin' Spot! I should say Happy Belated Birthday as I'm almost a month overdue! That's right, Sweet Stampin' Spot is 1 year old as of January 17th! Thank goodness this blog isn't a real baby as I have neglected it far too often! Here's a fun fold pocket card I CASE'd from Wendy Wiexler. She has a lot of fun project ideas and I frequent her blog quite often for inspiration! Thanks, Wendy! You might notice that I did make it my own in the sense that I used different stamps and a few different embellishments, but the shapes and layout is definitely from Wendy's card. The colours are Very Vanilla, Soft Suede, and Rich Razzleberry. The inside comes out and is has a sweet little teacup from Tea Shoppe stamped in Rich Razzleberry. I also made a male version of this card using some of the other stamps from You're Amazing (which is where the Happy Birthday is from). I love the use of an Antique Brad at the top. Simple, but not too simple. One thing I love about the Chevron Embossing folder is that it's cool for a feminine card as chevron is all the rage right now, but it's also a great masculine texture. So versatile! Oh, and Don't.Forget.The.Pearls! They're such a nice finishing element. The tiny ones worked perfectly on this card. Do a little sponging to soften the edges and call it a day. Feeling inspired? Not yet, huh? I know, it's Monday. Have a peak at some of my past posts to catch the crafting bug. I'm also on Pinterest. 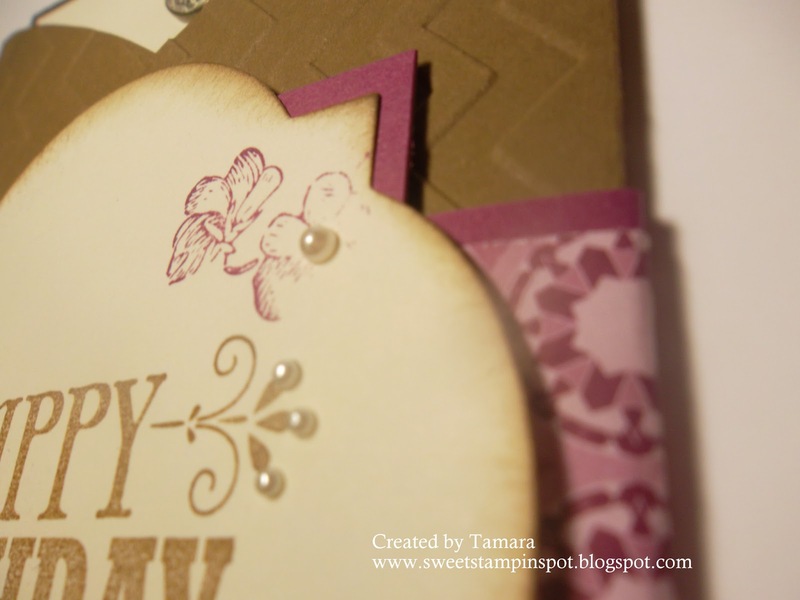 I've been pinning my cards onto a board called "Tamara Casorso Stampin' Up Demonstrator". Original. Yep. Stamp Sets: You're Amazing, Tea Shoppe. Card Stock: Very Vanilla, Soft Suede, Rich Razzleberry, International Bazaar DSP. Ink: Rich Razzleberry, Soft Suede Classic Ink. Accessories: Basic Pearls, Antique Brad. Tools: Big Shot, Chevron TIEF, Paper Piercing Tool, Simply Scored, a round plate, pencil, Paper Snips. Thanks! I know it's a little cheesy. Love this card!! And congrats on your blog day too!! !